David Zubatsky, Paul M. Sommers, and Ralph H. Nafziger are the winners of the 2011 Philip H. Ward Award for Excellence in First Day Cover Literature, presented by the American First Day Cover Society. 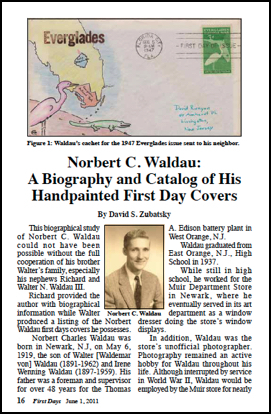 Zubatsky, of Lancaster, Pa., won first place for “Norbert C. Waldau: A Biography and Catalog of his Handpainted First Day Covers” in the June 1, 2011 issue of First Days, the official journal of the AFDCS. Sommers of Middlebury, Vermont, and Nafziger of Albany, Oregon, tied for second place. Sommers' “Walter G. Crosby’s Earliest First Day Covers” appeared in the January 15, 2011 issue of First Days. "The Palomar Mountain Observatory Issue of 1948” by Nafziger was also in the June 1 issue. Back issues of First Days are available for $4.00 each postpaid within the U.S. from Jeffrey Bennett, 1601 River Farm Drive, Alexandria, Va. 22308. Silver, gold and life members of the AFDCS also can download back issues on the AFDCS website, and a searchable electronic archive of every issue of First Days from its inception in 1955 through 2011 is available on DVD for $79 postpaid. The awards will be presented at the AFDCS membership meeting during Americover 2012, the annual show and convention of the AFDCS, which this year is being held August 10-12 at the Irvine Marriott in Irvine, Calif. 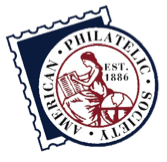 The award is named in honor of Philip H. Ward (1890-1963), the distinguished Philadelphia stamp collector, dealer and journalist who was a pioneer in the field of first day covers. The award was instituted by the AFDCS in 1964. All articles appearing in First Days are automatically considered for the award; articles in other publications may be submitted for consideration. Information about the Ward Award can be obtained from the Ward Award chairman, Barry Ellis, 5117 Arrowhead Pass, Fort Wayne, Ind. 46804, or e-mail bellis1230@aol.com.